Versions prior to 1.5.0 had a critical issue. Please accept version 1.5.0 or later. It works in conjunction with basic add-ons and options. I aim for add-ons that do not have options and commands if possible. when you place the cursor on the SpecButton, the EquipSet window pops up. Only the EquipSet corresponding to the SpecName(ex:Holy, Destruction) of the SpecButton and the EquipSet not included in any SpecName are displayed in the list. You can drag a Shift+LeftMouseButton to a SpecButton. If you do not like the location, you can initialize the location by double-clicking the Shift+LeftMouseClick. 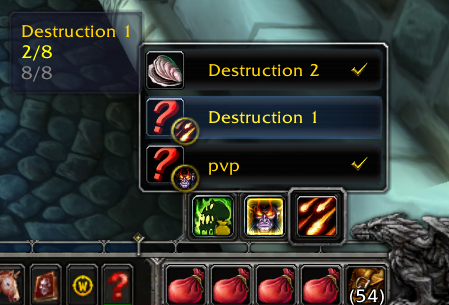 Location storage uses the wow official function. It is therefore managed on the server. ps. I am Korean and I am not familiar with English. Please understand. ourselves or can this addon use it for us? To do that, I think I need to create a Talent manager first. I'll think about it. Sure. Looking good, so far.